In fine art of the early twentieth century, ‘cubist’ painters and sculptors caused a sensation by pioneering a style that was fluid and emotional yet rigorously geometric. Earlier still, eighteenth century Baroque musicians thrilled audiences with ‘counterpoint’; music that was melodic and harmonious yet structured with an almost mathematical precision. The recurrence of similar themes in widely differing arts is perhaps not so surprising. When successful, these are themes that resonate deeply within us; they amplify what is common to our nature and remind us that we are in the world together. In sixteenth century Venice, a form of glasswork emerged that anticipated these juxtapositions to similar popular acclaim. In fact, the technique of ‘reticello’ went on to become an enduring trademark of Murano technical skill and artistry. 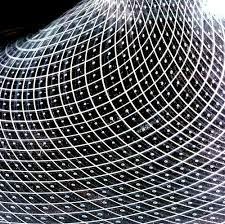 To this day, well executed pieces of reticello glass are coveted by collectors and displayed with great pride. The form is characterized by a transparent glass base which is embedded with a network of crisscrossing threads of opaque glass, forming a lattice of diamond shaped pockets. Classically, white 'latimo' glass was used in a clear 'cristallo' base.The overall effect is reminiscent of fine lace or of fishing net, both of which are strongly evocative in Venetian culture. When executed in the classical technique of the island’s glassblowers, each diamond in the pattern contains a single bubble of trapped air, perfectly centered and uniformly sized. On Murano, the "piera" is coated with a thin layer of clay from the laguna marshes. This is rich in salt and does not stick too much on the glass even if overheated. Then they preheat the, piera (called a 'plate' in the US) to dry the clay. While it is still hot but not scorching they lay down the canes so they are partially warmed before they go in the furnace. Remember that they are not annealed [and could easily shatter from thermal shock]. Then two little square metal pieces are placed at the two ends to hold the cane in place. These are called fereti (V) ferretti (I) . Some of these same terms are also used in the US by skillful glass blowers. On the end of an iron blowpipe, the fused mat of glass rods is wrapped around into a hollow cylinder. Next the open end is gently worked closed. This forms a sealed bubble of glass that can be manipulated by standard glassblowing techniques. 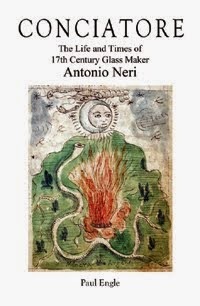 Soft from the heat of the furnace, the glass can be given a twist so the parallel threads form a loose spiral. This piece is stored in a ‘garage’ kiln while a second bubble is formed in the same way but with the spiral running in the opposite direction. The first bubble is opened wide at one end, removed from its iron rod and placed in a cradle on the floor which holds it upright. The second bubble is carefully lowered into the open end of the first bubble. The glass artist stands above, with the second bubble inside the first and blows, inflating the inner glass until it comes in contact with the outer bubble. Because both glass bubbles are formed with canes, they have a ribbed texture both inside and outside. When the two glass bubbles contact each other, the high-points of the ribs meet first, which is where the threads of the two bubbles cross. The valleys of the ribs are where one cane is fused to the next; these areas cross between the bubbles at the center of each diamond in the pattern. The two bubbles fuse together trapping air in the valleys. As the glass is worked and heated these regions form small, perfectly round air bubbles trapped inside the glass. You can see this for yourself by taking two or three fingers of each hand and crossing them against each other. Imagine the threads of opaque glass running down the center of each finger. The air bubbles are trapped where you can see light between your fingers. 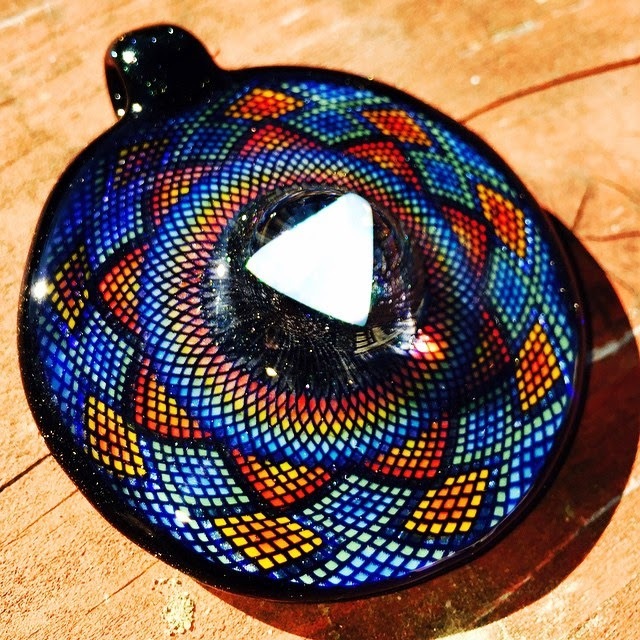 The distinctive diamond pattern of reticello has been successfully achieved with other glassmaking techniques. In flameworking, glass is manipulated using only a torch and handtools. The torch is fixed to a bench where the artist either stands or sits. In general, this is a more accessible technique because it does not require a glass furnace. Here, the reticello pattern is accomplished by starting with glass tubing. The crisscross pattern is ‘painted’ onto the outside of the tubing, one line at a time; with very thin rods of glass known as “stringers.” In one version, evenly spaced straight parallel lines are drawn along the length of the tube. The tube is then reheated in the flame and twisted. Next, a second set of lines are drawn twisting in the other direction, forming the diamonds. The ends of the tube are drawn down and one end can be mounted to a rod or tube of glass and further manipulated in the flame. In a testament to the continued popularity of reticello, a new colorful variation of the flamework technique has emerged within the past decade, among American flameworkers. This has been playfully dubbed “fillacello.” After painting the fishnet pattern on tubing, and further working the glass, the individual diamonds are “filled” with various colors using stringers. The resulting effect recalls mosaics and the ancient inspirations of reticello. The iron tool used to move the 'piera' of filigrana cane in and out of the furnace is called a 'pasorale' (V), 'pastorale' (I) = pastoral, named after the staff carried by the pope. It consists of a straight rod with a U-shaped fork in the end. Thanks to Emilio Santini for his kind assistance with Muranese terminology and knowledge of hotshop technique. My research point to the first examples of this technique emerging on the west coat of the United States around 2005-07. (Further information on its origin would be greatly appreciated).